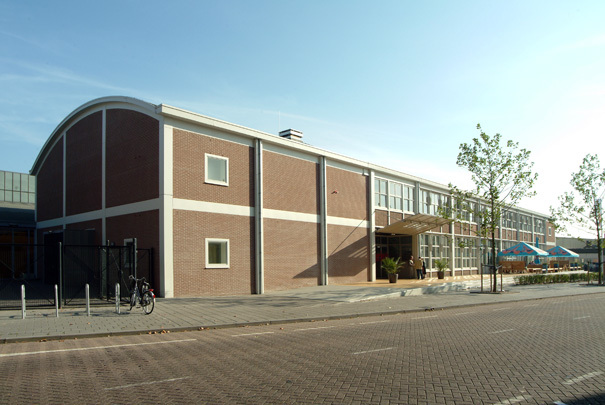 The former biscuit factory of the Verkade company has been converted and expanded into a cultural centre, retaining the most characteristic parts of the original building. The long brick biscuit production hall with its distinctive barrel-vault roof now contains a grand café. This hall has been 'invisibly' extended to house a small theatre auditorium with beyond it three rehearsal rooms each with a shed roof retained from the original factory. The main auditorium is in a new block built against the head end of these former production halls. With its sleek finish of glass panels bearing the former factory's name in gingerbread letters, this block is clearly the odd man out.